Product design involves the creation of new and innovative products that are both aesthetic and functional. The objective of product design is to analyse real-world issues, visualize feasible solutions, and provide tangible solutions. It encompasses design, technology, and mechanics of a product. Only when these three elements blend, do you have a usable product. Simply put, product design offers real solutions to everyday problems. Applications of product design span multiple industries. Furniture, food, sports, leisure, travel, jewellery, medicine, and many more fields rely on product design to function effectively. Product designers begin the design process by envisioning the solution and creating sketches. They then create a working prototype of the solution. The prototype is put through a series of tests to ensure it fulfils its purpose effectively and efficiently. Once it passes the testing phase, they begin the manufacture of the product on a large scale. The entire creative process – from idea to execution – involves not just product designers, but engineers as well. 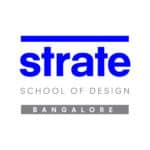 The Product Design course at Strate, Bangalore aims at training designers who are able to implement systemic thinking and design services and products satisfying those usages and issues. It is open to designers who want to create artistic yet functional products. Before you decide to dive in, it is imperative to understand what product designing is all about, what the industry encompasses, and what the expectations from a product designer are. Today, it is no longer possible to design objects that are disconnected from usages and societal issues. Between the realities of industrial production and the ambition to create meaning for his contemporaries, today’s product designer navigates through objects’ materiality and services’ immateriality. Thus, we need to prepare students to consider all human issues from a new perspective, generously and accurately, to design and offer just and beautiful experiences. The scope of product design is far-reaching and lucrative. Demand for product designers has seen an upward growth over the years. At present, the industry is developing at an annual rate of 10%, opening many opportunities for budding designers. Product designers who want to make a career in this field should be highly innovative with a desire to transform their ideas into sustainable and useful products. At the end of the product design course, you will receive a BSc/MSc in Design from Jain (Deemed-to-be) University and an equivalent Master’s diploma “Mastere in Design” with RNCP credits from Strate School of Design, Paris. The minimum qualification required to apply for Strate’s Product Design course is a pass in Class 12 from any recognized university or board with an aggregate of at least 50%. There is no entrance exam for the product design course. However, there will be an interview with the school’s Dean, Thomas Dal, or a member of the faculty to assess your interest in the course. Curriculum for the Product Design specialization. The first two years are common for all specializations. It is in the third year that you opt for your preferred course. Click on each year to see what the product design course involves. The product design course syllabus covers various aspects of designing advanced and innovative products. You will learn to design objects and their usages with a sustainable approach. You will apply your knowledge to put beauty in the service of everyday utilities. The product designing course at Strate will familiarize you with material design, Photoshop, Illustrator, 3D and 2D techniques, sketching, etc. Classroom sessions impart core visual, creative, technical, and analytical skills, along with knowledge of materials, technologies, manufacturing processes, trends, and sustainability. Besides subjects allied with the course, you will also work on multiple projects to acclimate yourself with product designing techniques. This course aims to make you a product designer capable of thinking and designing services and satisfying product uses as the challenges of the 21st century.